Review of "The Tale of Peter Rabbit"
Peter Rabbit is one of four bunnies belonging to their mother, Mrs. Rabbit, who instructs them to not go into Mr. McGregor’s garden because “your Father had an accident there, he was put in a pie by Mrs. McGregor. Not run along, and don’t get into mischief, I’m going out.” Of course while Mrs. Rabbit is not watching the bunnies, Peter, who was not a good little bunny like his siblings, Flopsy, Mopsy and Cotton-Tail, ran to Mr. McGregor’s garden. Peter is chased by the farmer – losing his bunny clothes that ended up being used as a tiny scarecrow by Mr. McGregor. He gets wet from jumping into a watering can, smartly decides to avoid a cat, and then runs himself out so that he is tired and frightened. He finally makes it back home. There his mother gives him only tea while the other bunnies have bread, milk and blackberries for supper. The best part of this book is the pictures. They are so delicate and have just the right amount of detail. They are what grab your attention the most. However, the story is quite basic (though I question Mrs. Rabbit’s mothering skills) and children can easily get into a story that has a believable character like Peter. A rabbit would go into a garden and get chased. The pictures give you just enough vivid imagery to go along with the choice wording (“Flopsy, Mopsy and Cotton-Tail” – such good rabbit names!) You get the feeling of Peter running for his life, afraid he will be put into a pie if he is caught. Interestingly enough, Booklist (November 01, 1987) states that, “Undoubtedly one of the most famous books for children, this enduring classic has been reprinted more than 100 times in the 80-plus years since its debut, resulting in a loss of much of the artist’s careful brushwork, color, and detail. To rectify this, the original illustrations have been re-photographed, giving children and adults a beautiful new edition to love and appreciate. All 23 of Potter’s treasured offerings have had similar transformations, and librarians will want to consider replacing their old copies.” I can understand wanting a modern, more vivid book to offer their patrons. Since it is such a well loved book, there are so many editions out there that keeping something as highly popular makes sense for libraries. Being a classic, well-loved book, I would like to see more classic books that go along with Peter Rabbit’s tales. Even Frog and Toad and The Pokey Little Puppy would be appropriate in giving young readers the good, basic, classic children’s literature. I personally like If You Give a Mouse a Cookie too. It’s another way to show the supposed animal-human relationship that The Tale of Peter Rabbit has. 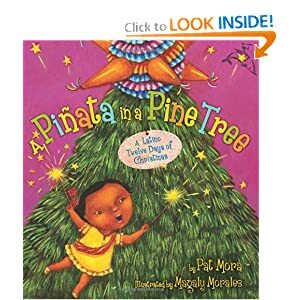 Review of "A Piñata in a Pine Tree"
Stemming from the Christmas carol, “The 12 Days of Christmas”, Pat Mora creates a Latino version of the son that not only includes Spanish words, pronunciations and vocabulary, but includes the musical score for the song to be played as the children sing. The little girl in the story is being given gifts such as “dos pastelitos” (two small pies or turnovers) and “siete burritos bailando” (seven dancing donkeys” from her “amiga.” When the “doce angelitos celebrando” (12 angels rejoicing) appear by the end of the book, we learn that the “amiga” is the new baby sister that the little girl has been anxiously awaiting for. Vardell writes, “books and their illustrations should also build an appreciation of beauty and aesthetics” (57). This is the case with A Piñata in a Pine Tree; the colorful pictures show the Mexican style and decoration while also letting the reader appreciate how pretty each page has been designed. Vardell comments that, “it is also important to consider how words and pictures are used to depict culture in children’s picture book” (60). This book definitely shows young readers the culture of Mexico with the language, colorful artwork and original take on the classic Christmas carol. I would like to see a Storytime themed with different Christmas customs so young readers could get a glimpse into how children in other parts of the world celebrate the holidays. There would be a vast amount of books to choose from various countries, religions and cultural backgrounds. Opening the world to young readers through a familiar event like Christmas would be a great way to get children interested in multicultural literature. Kitten sees a big bowl of milk, just waiting for her, up in the sky. Despite her efforts she cannot reach it. She tries to lick the bowl, she tries to climb the tree for the bowl, she even sees the bowl in the pond below her. Still, she never gets to the milk. She only gets bugs on her tongue, bumps on her nose and becomes sad, wet and tired. Eventually, when she finally gives up and goes home, she finds her bowl of milk just waiting for her on the porch. As a picture book, I found this interesting that it is not in color. The story is very cute and the way it reads is quite entertaining. Still, there is only simple art work that gives you focus into the story. There’s not too much detail in the wording or the pictures to distract you from the basic tale of Kitten. As a character, Kitten serves as credible and convincing as a personality. The plot is simple and Kitten’s motivation is believable. What would a kitten think if it took notice of the moon? It may very well think that it is a bowl of milk. The illustrations work with this characterization and plot because without the words, you could still look at the pictures and know what was happening in the story. I enjoyed this book very much and would like to purchase it for my own collection. This book has won the Caldecott medal. School Library Journal (April 01, 2004) review states, “Done in a charcoal and cream-colored palette, the understated illustrations feature thick black outlines, pleasing curves, and swiftly changing expressions that are full of nuance. The rhythmic text and delightful artwork ensure storytime success. Kids will surely applaud this cat’s irrepressible spirit. 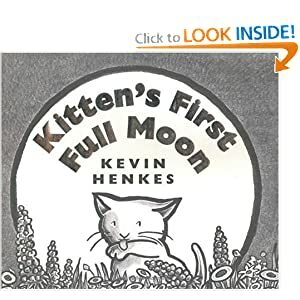 Pair this tale with Frank Asch’s classic Moongame (S & S, 1987) and Nancy Elizabeth Wallace’s The Sun, the Moon and the Stars (Houghton, 2003) for nocturnal celebrations.” I would like this kind of book to be used at Storytime in the library for such themed activities. For the craft to go along with the book, we could make cats out of paper plates and googly eyes (as you would when making the fish for “under the sea” themes Storytimes.) FamilyTLC.net suggests that for comprehension strategies, children can be asked what the moon looks like in real life in comparison with the cover. Then as the children read, ask them what the moon looks like to them. After reading, children can be asked what other things they see in the night sky and what other objects they may seem to look like as well.